I have some new Girly Bits nail polishes to show you today! These are from the Girly Bits Calendar Girls collection. I will be using Girly Bits' descriptions for these polishes, since they will be more accurate than mine! Indian Summer is a mix of pink, blue, periwinkle, copper and gold, in a sheer periwinkle base. This is a beautiful glitter! There is a gorgeous pinkish shimmer in the base too. 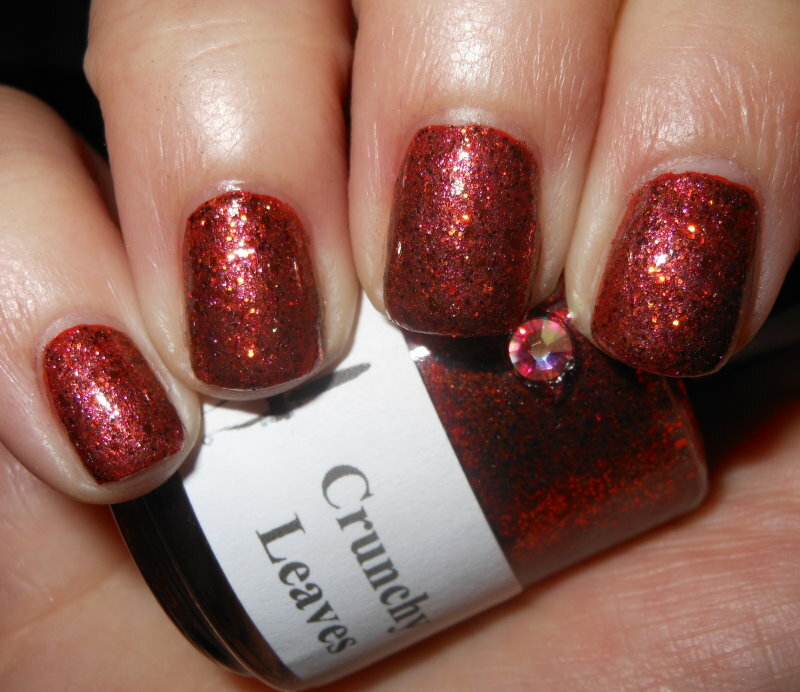 I love the combination of colors used in this glitter polish. I'm a sucker for blues mixed with gold and copper, so this polish makes me very happy. It applied well very easily too. I used two coats over my base. I think this one would be better for layering. 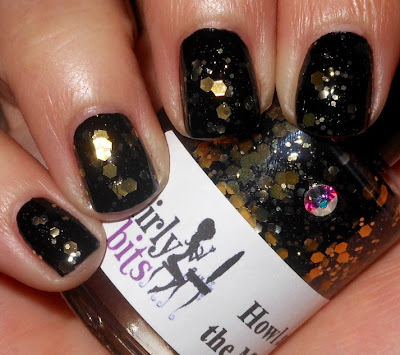 Howl at the Moon is a blackened blurple jelly with various sizes of gold hexes. I love the combination of gold and black here. I love the variation in sizes with the glitters. I think this polish though it is themed for October, would be great for the holidays too. I think black and gold is a ritzy combination colors. It's glitzy! I could see this as a great polish for holiday partys and New Years too. You could build this polish up in 3 coats, but I preferred to layer it with 2 coats over black. I like instant gratification! Crunchy Leaves is a medium-dense glitter mix of orange, copper, brown, and red, in a sheer earthy base. I needed a glitter like this. This is so perfect for fall. The combination of colors is beautiful, and the density of this glitter is a nice change from some of the sparser glitters out there. I don't own any polish like this! This is 2 coats over a base. You could use 3 coats to get near opacity, but I personally think a base gives it a bolder appearance. Pam from Girly Bits recommends you shop her polishes from her stockists Llarowe, Harlow & Co, Overall Beauty, and Mei Mei's Signatures as she plans to keep to have her products stocked well here. She does have her own shop site, but she will be doing fewer and smaller restocks there. *I received these polishes to review by Girly Bits. Indian Summer is definitely my favorite of these three. I love the subtle shimmer in it! love all three! I really love the base you have for indian summer, i'll have to try that out! Girly Bits are always amazeballs! Love!